Discussion in 'Thumpers' started by Wind_Rider, Mar 9, 2013. 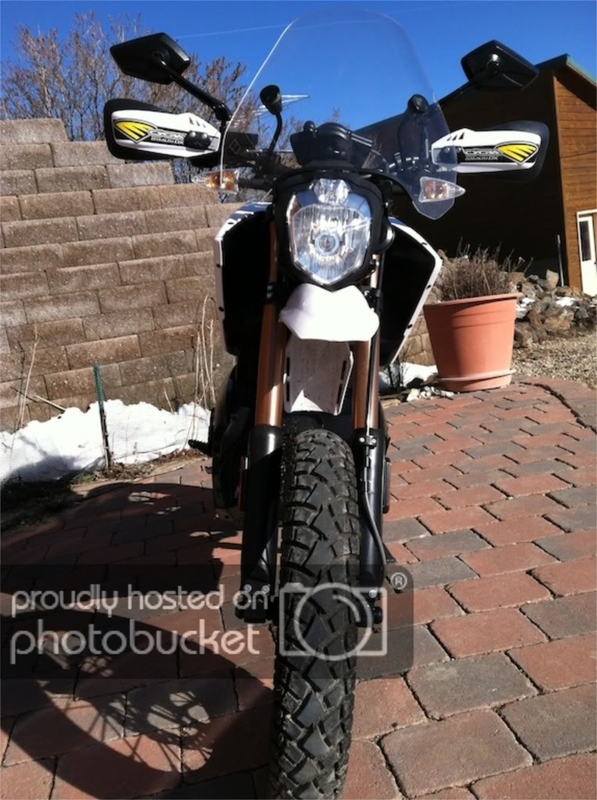 I have followed Zero Motorcycles for several years now. They have made great strides in the past years in making an EV that is actually practical to use and own. 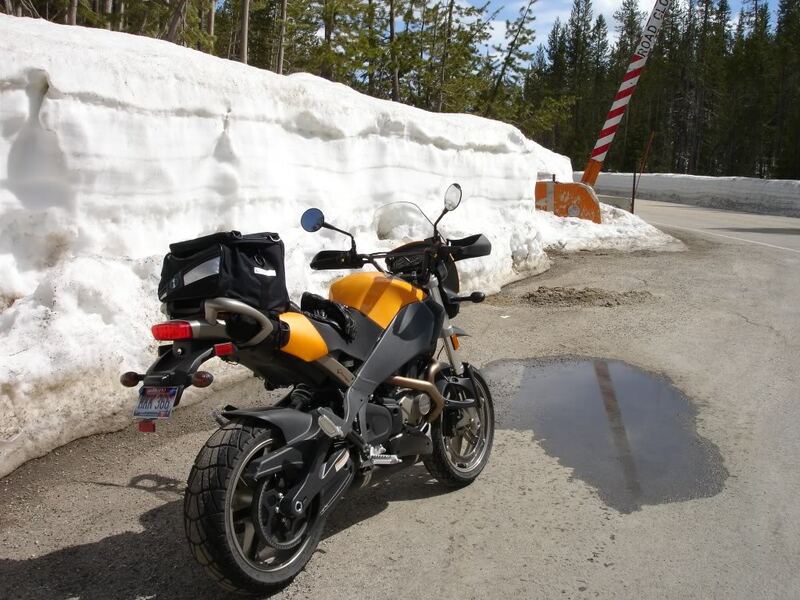 In early 2013 I took delivery of a new 2012 Zero DS. 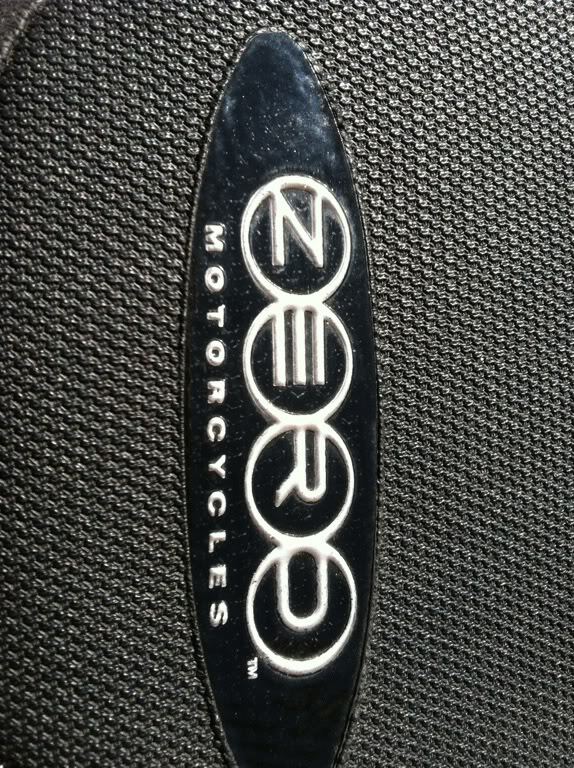 This thread will chronicle details of my journey to electric motorcycles and in particular the 2012 Zero DS. When reading reviews on ADV I think it is important to understand the experiences of the reviewer so here is some history on my riding background. I have riden over 250,000 miles altogether with only one accident that required a hospital visit and killed a motorcycle. I ride a motorcycle whenever there is not ice on the road and it can transport what needs to be transported. 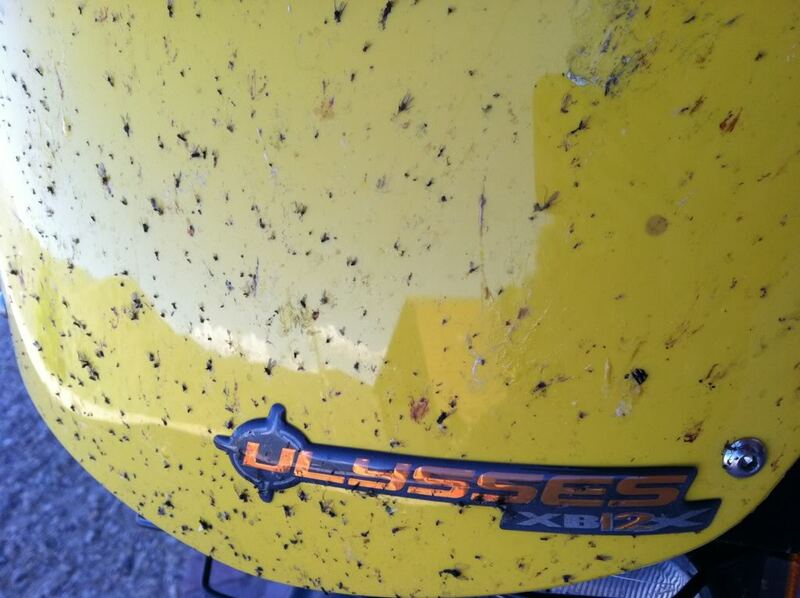 I live up 3 miles of steep rough dirt road so every ride involves dirt. I live in Idaho which is dual sport heaven for about 7 months of the year. I commute to work on motorcycles. I have a family, a day job, and am in my mid 40s. I read ADV in the winter to get my fix virtually when there is snow and ice outside. 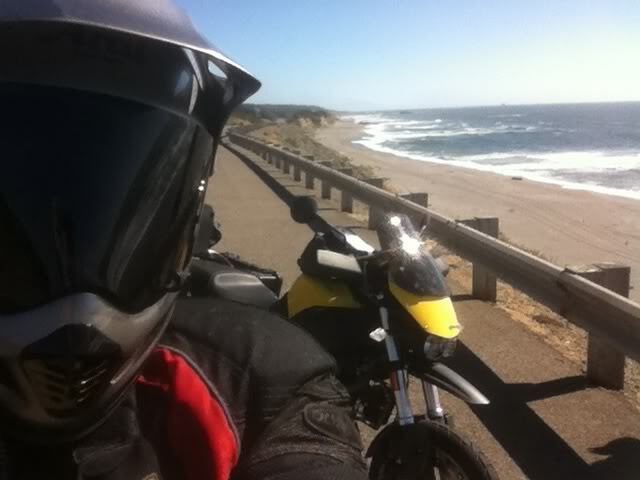 Here are some pics of some of my favorite motorcycles from my recent past. I was just looking a Zero Motorcycles at a dealer in Las Vegas. Very tempting. I had been watching and reading about Zero Motorcycles since they first came out. 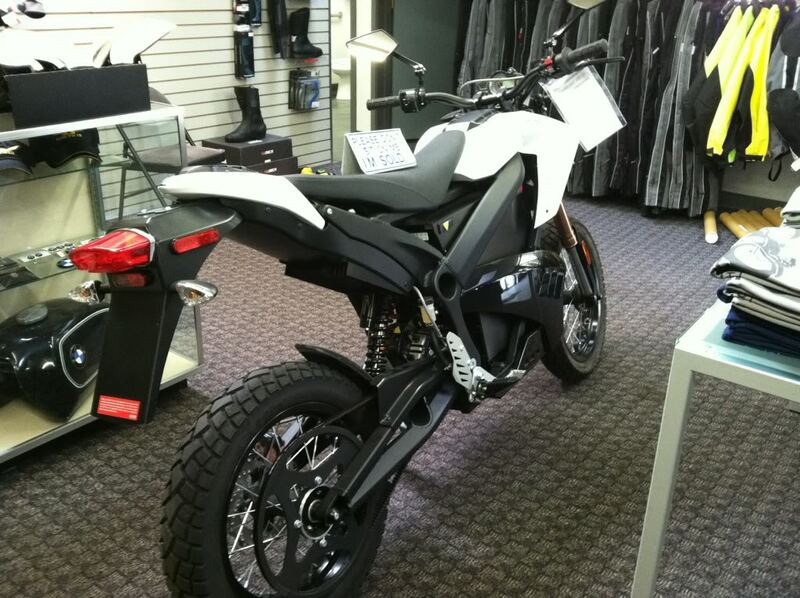 Last summer a local shop (Big Twin BMW) started handling Zero Motorcycles and I had a chance to test drive a 2012 Zero DS. I really liked the silent, smooth rush of electric power but I could not see the $14,000 price tag fitting into my budget. 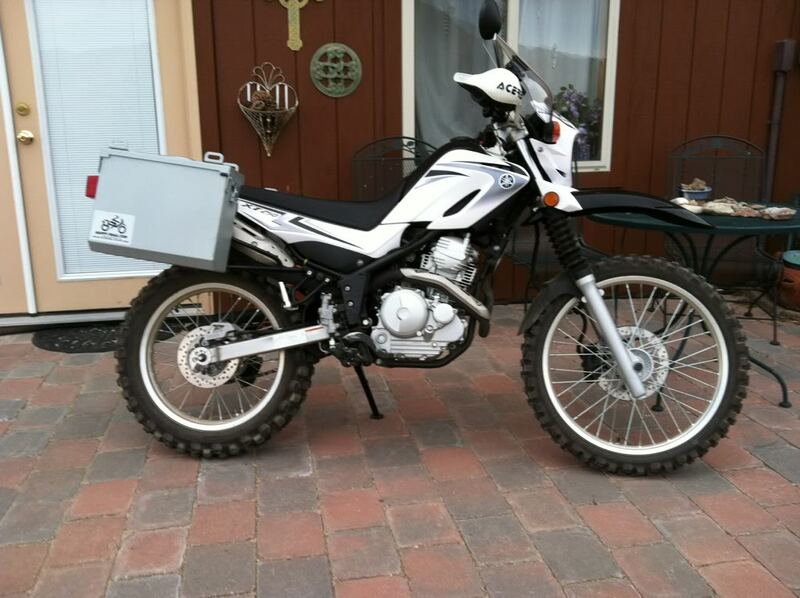 In the last year I had downsized my motorcycle from a 2010 Buell Ulysses to a 2008 Yamaha XT250 and I was having more fun in the dirt and riding a smaller bike. 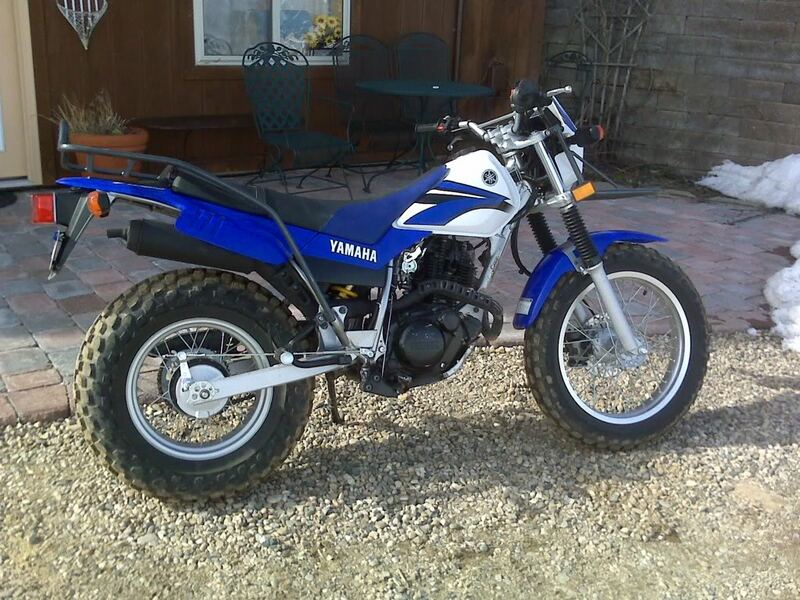 I was planning on getting a new Honda CRF250 this spring. 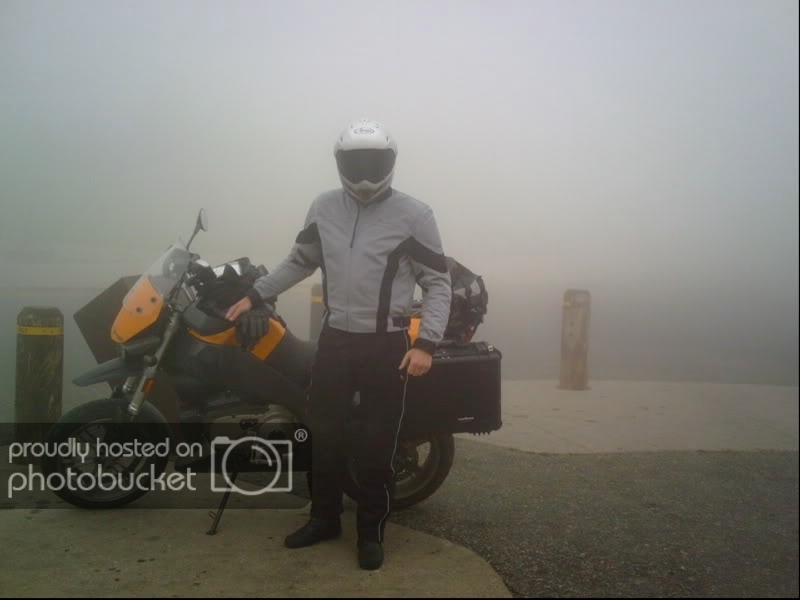 I had decided that for the type of riding that I am doing now I don't need a really large, expensive motorcycle. Through a strange series of events that involved winning a raffle, year end discounts, and Zero's Cash for Carbon program, I ended up with a new 2012 Zero DS in my office in February of this year. Yes, I put it right in my home office and let it sip electrons to keep the battery topped up in the cold. I decided that electric technology was a fit for 95% of my riding at this stage of my life. I should be able to make some great 40-80 mile loop rides on the weekends and I can easily make my commute of 32 miles one way on the Zero DS. I have a place to charge at work to make sure there is enough juice to make it back and run a few errands if needed as well. I will miss long rides. 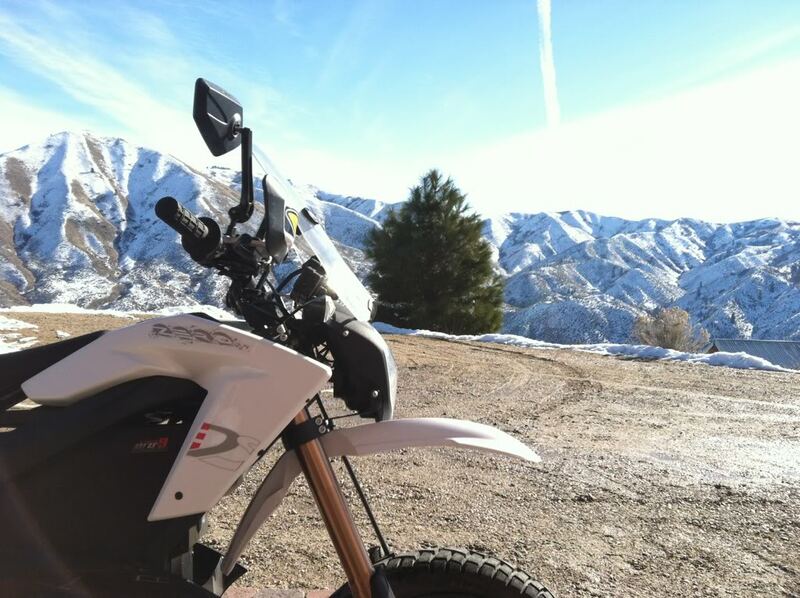 The Zero can not do 500 mile days or all day back road epics. For this year at least the Zero DS will be my only motorcycle. Here is a picture of the bike the day that I committed to purchasing it on the showroom floor at Big Twin BMW. Here are some detailed pictures of the DS if you have not seen one in the wild. 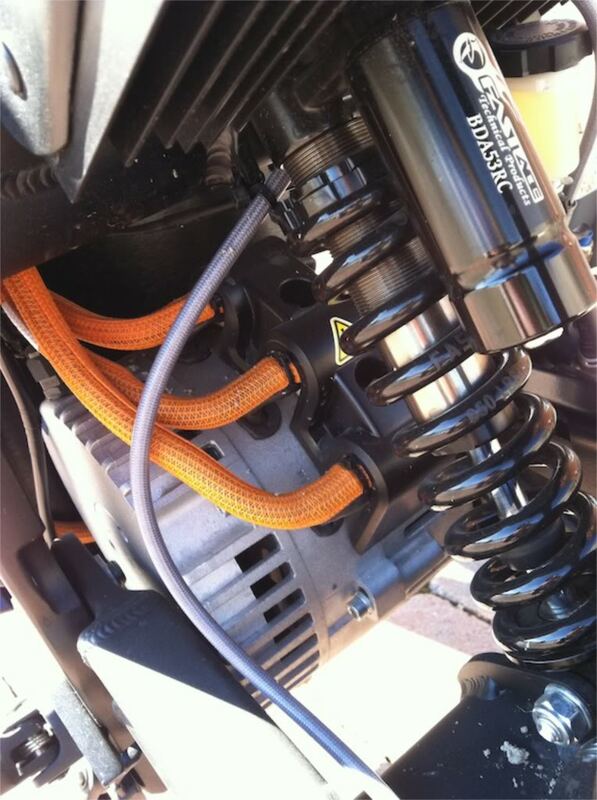 Fast Ace suspension components allow for decent suspension performance and good adjustability. The motor is AC Brushless. There is no transmission. The motor is directly coupled to a belt final drive. This makes for a very smooth and silent final drive. 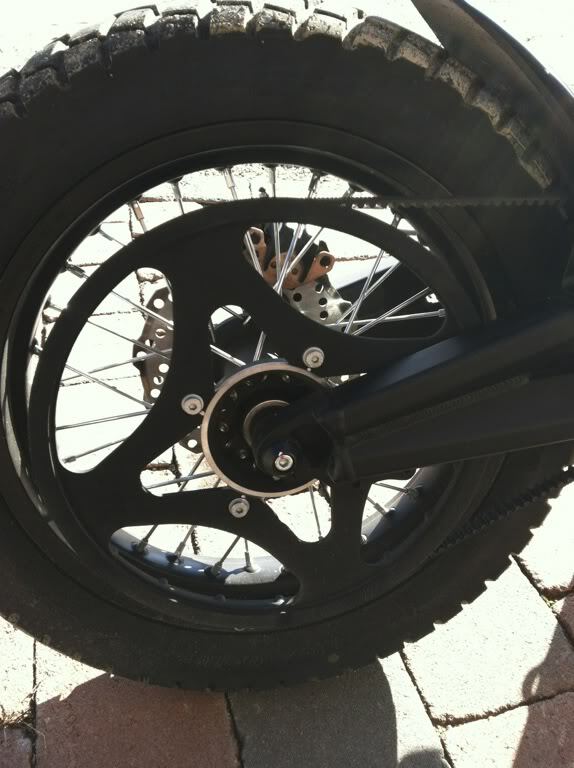 I had belt drive on my Buells and HD and like it. I hope it holds up to some dirt use. I like the style. Not everyone agrees. 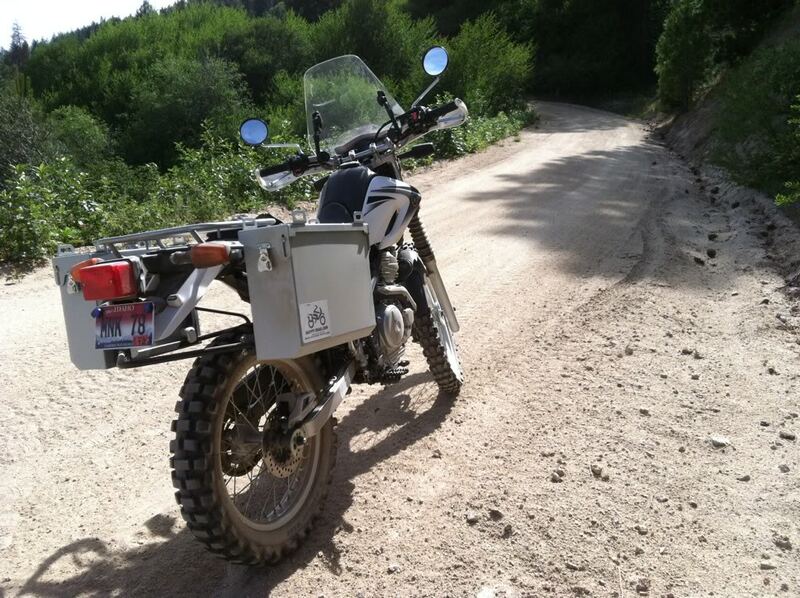 Dual sport tires provide decent traction in the loose stuff and nice manners on the road. 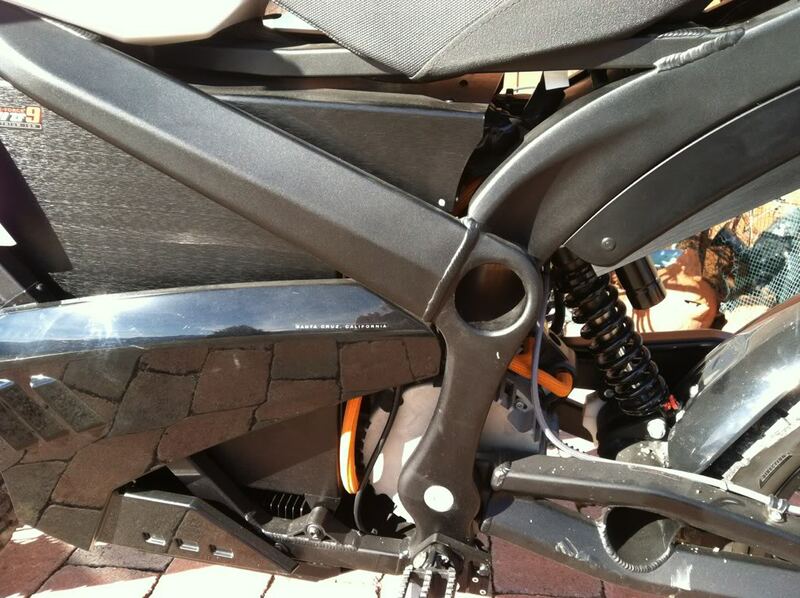 The rear wheel is a 16" which will be really limiting in terms of what rubber can go on it. 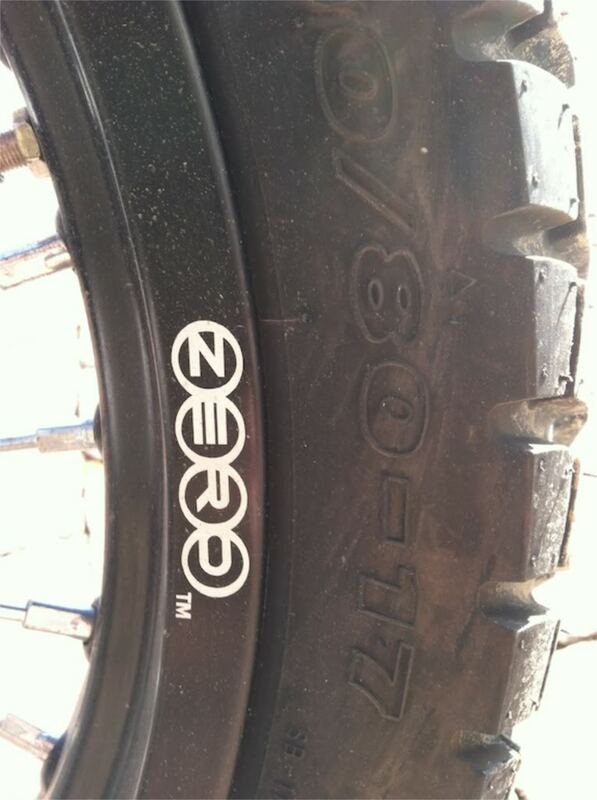 The 2013 Zeros have more standard wheel, tire sizes. The charge port is in a dumb location for a DS machine. 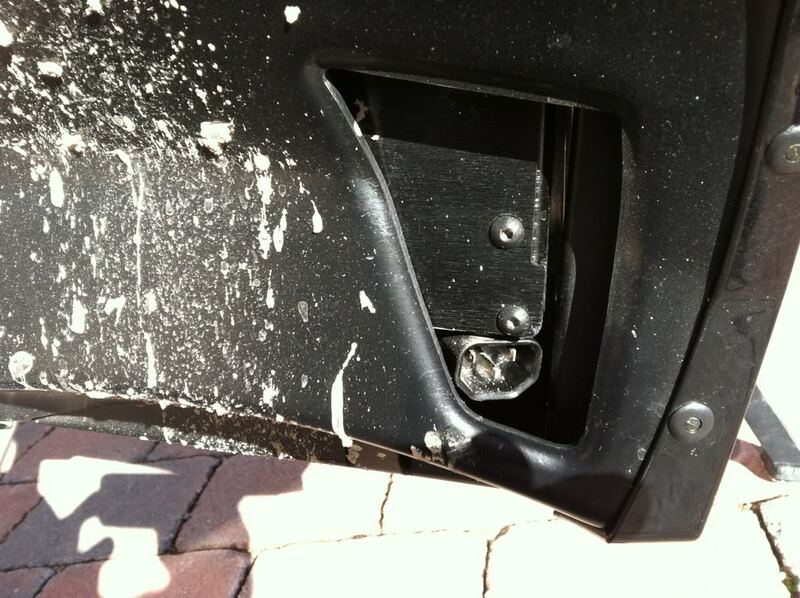 I cut off a power cord plug and put it in the socket when riding to keep it clean. Again, the 2013 models moved this to a more logical location. The on board charger lives here. Cool mirrors. Nice view of elbow. Typical of most motorcycles. Instrumentation is simple. GRN light tells you it is on. 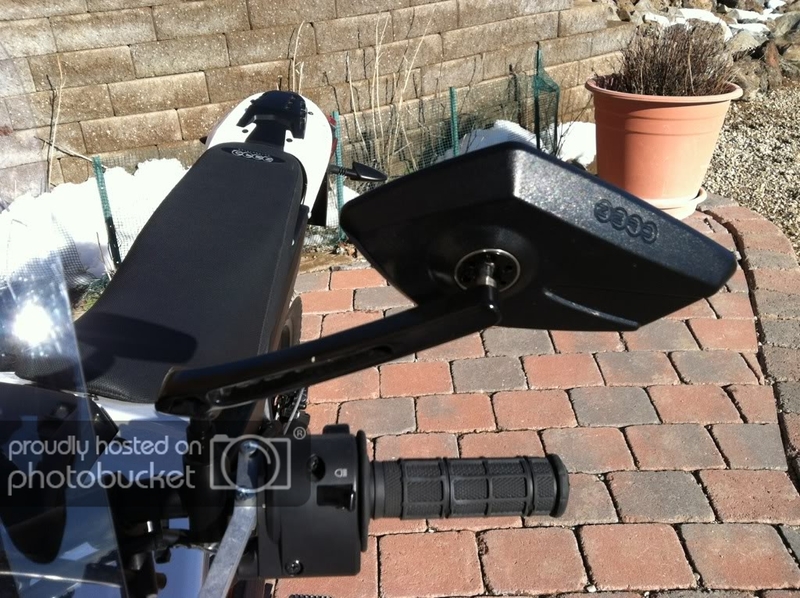 Turn on the key, put up kickstand, release kill switch, twist throttle and go. Nice little details like the logo on the seat. The frame is a work of art. Absolutely beautiful. 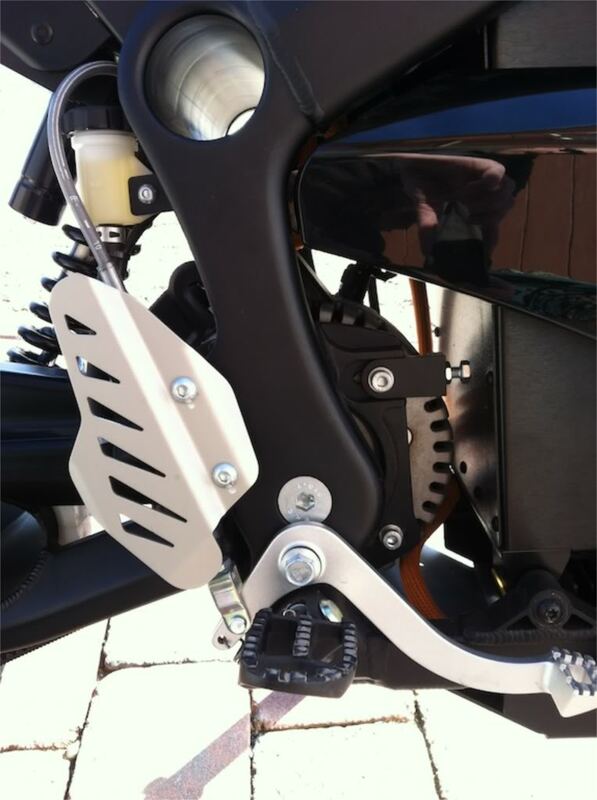 Same for the swing arm. Brakes are single disc front and rear Hayes, as in Mtn bike fame. 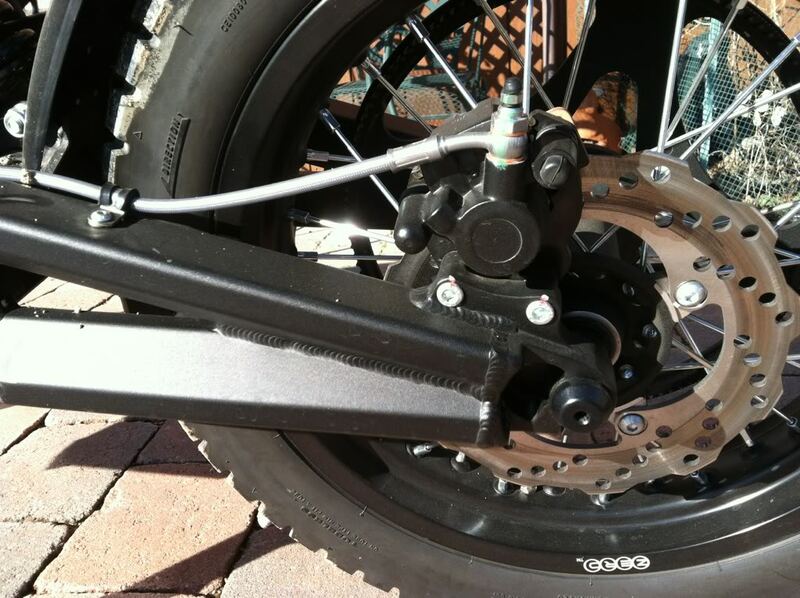 The rear brake doesn't get a lot of use as the motor provides regenerative braking. 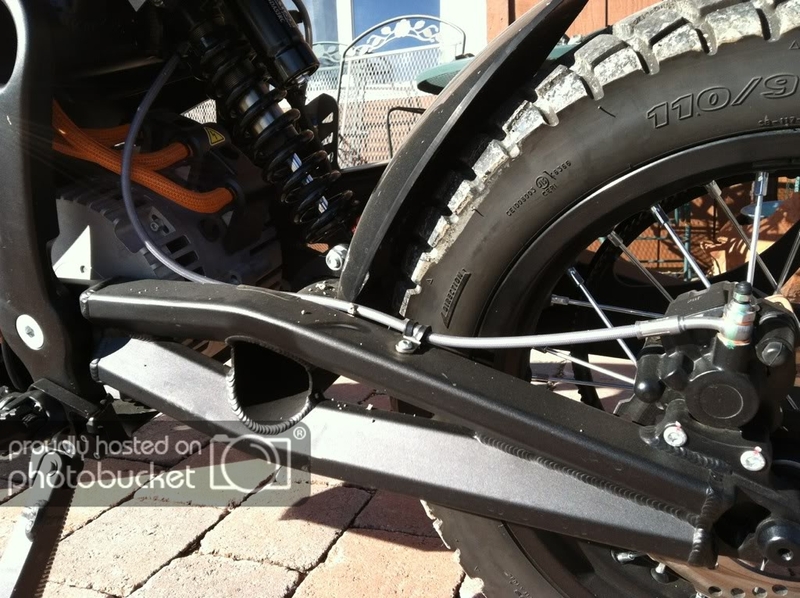 Braided steel brake lines are a nice touch. 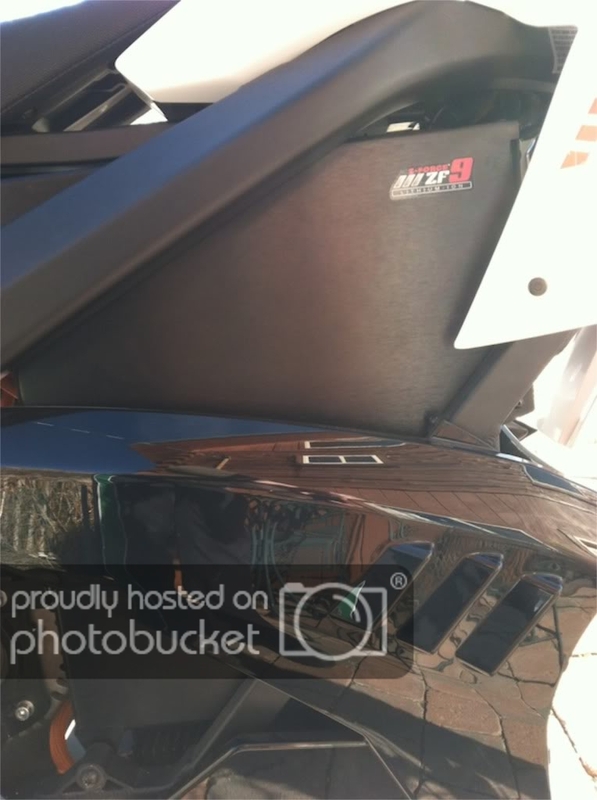 Zero Force 9KiloWatt battery box. The heart of the bike and weight is here. 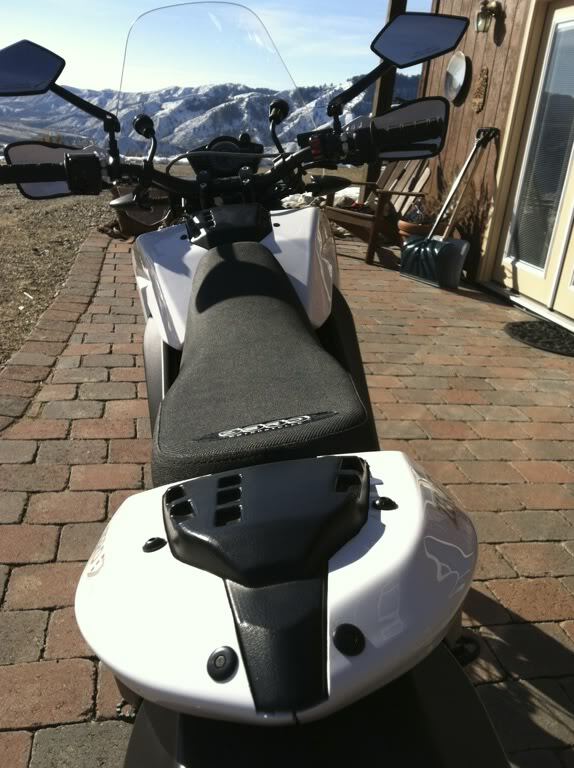 I had Big Twin add some hand guards and a windshield for cold weather morning commutes here in Idaho. 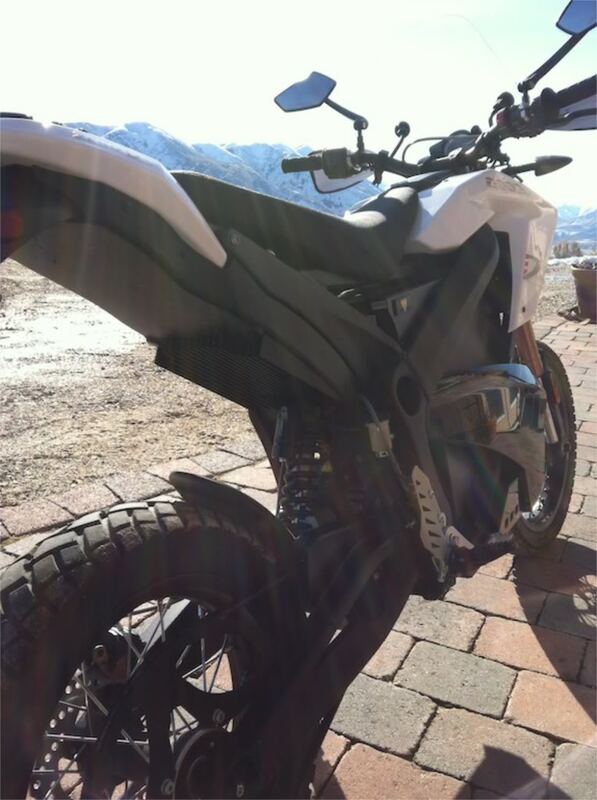 Since the Zero DS runs an electric motor, the throttle response is based on how much current the battery dumps into the motor when you twist the throttle. 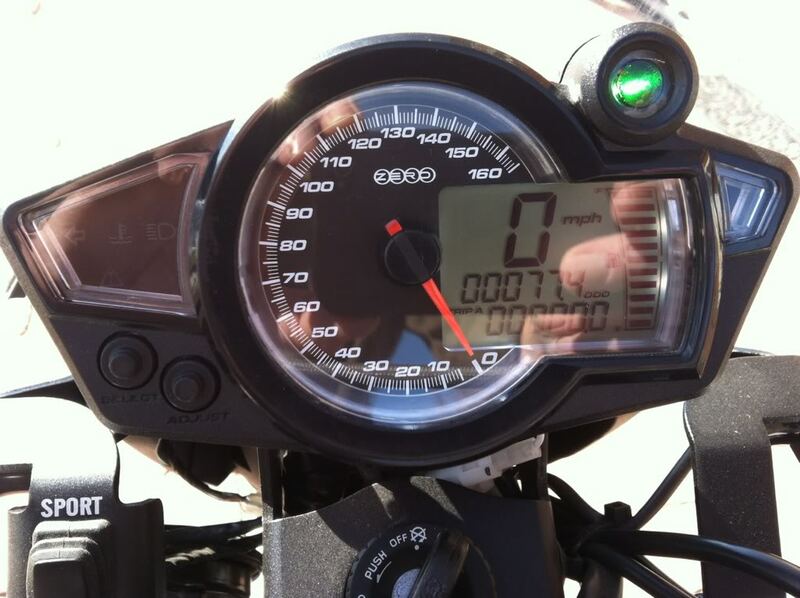 There is a rocker switch by the Speedo with Sport and Econ modes of operation. In Sport mode the throttle response is much more aggressive and that comes at the expense of range. In Sport mode the regen is also less so when you roll off the throttle there is less engine braking and less current going back into the battery pack. 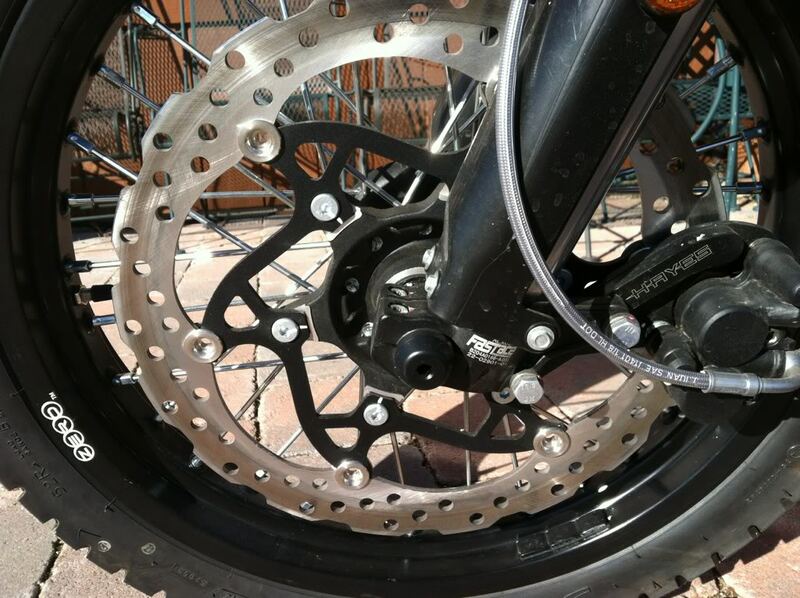 In the real world, acceleration is different on an electric bike and one reason is the gearing. There is only one final gear ratio so it is effectively like starting from the line in top gear. Acceleration from 0-5 MPH is underwhelming as current starts to flow and the motor pushes into that tall gear. Once underway, roll on acceleration is quite brisk and fun, especially in Sport mode. In comparison to ICE powered bikes I would rate it roughly equivalent to a 300-400cc motorcycle. It is not fast and will not pull power wheelies, but it is entertaining and fun. Power delivery is extremely smooth. There is no vibration, no noise, nothing shaking under you as more current is poured into the motor. It is an entirely different experience in many ways. 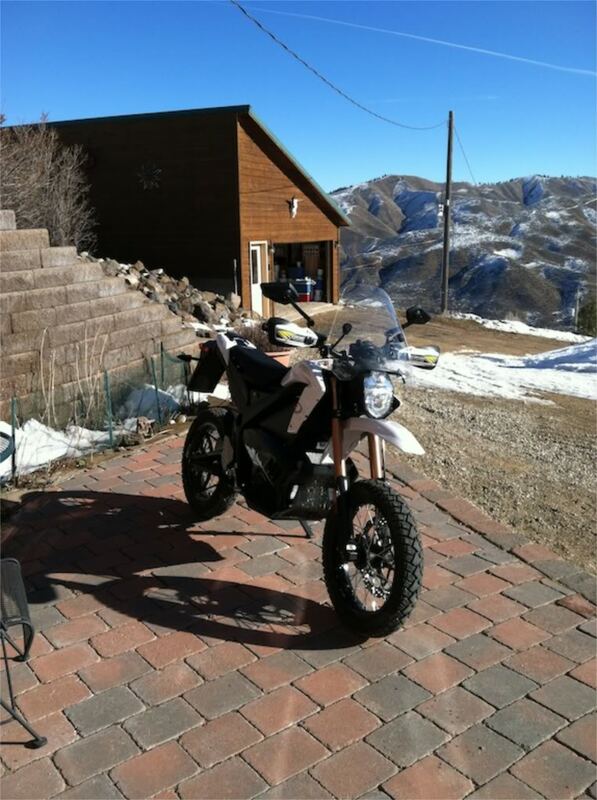 I have put almost 200 miles on the Zero now and I am enjoying it greatly. I like the silence, the smoothness and lack of vibration, and the almost liquid smooth power delivery. I like the uniqueness of the motorcycle and the fact that I am going to be transporting myself around on 100% locally produced electric power. Here in Idaho it is mostly Hydro power so it is really a clean and renewable energy source. It is really fun to ride BY the gas station and NEVER stop for gas. When I registered it at the DMV they had troubles with how many CCs it was... It has no CCs. When I started this thread on the ADV forum there was no nice place for it.... I put it in Thumpers because I thought that Single Cylinder fans might be more attuned to the simplicity of the Zero. AND it does have a single battery pack. 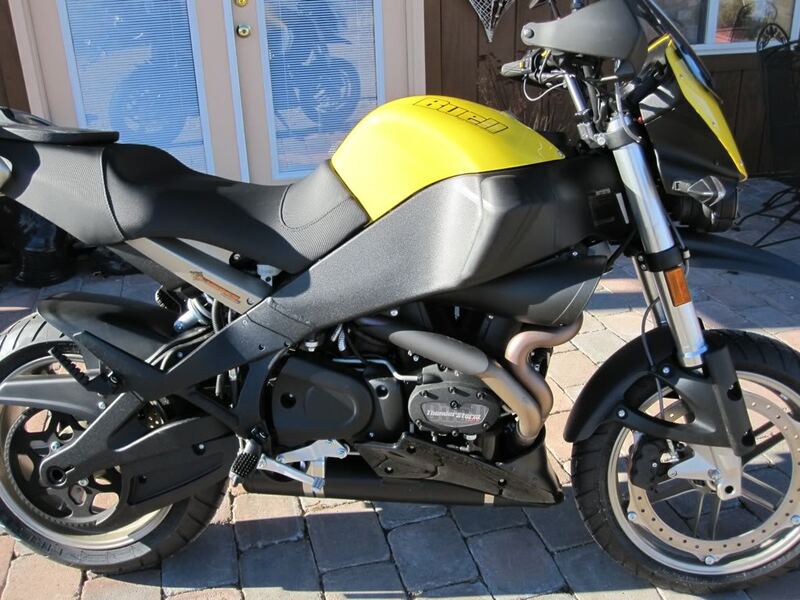 It is really something quite different from other motorcycles. I'm going to ride my Versys a lot this summer as a commuter and a light touring bike. If it turns out that I don't go anywhere, and mainly ride in town. I may consider a Zero for around town riding. I would get the SM version, I think. I'll have to see about plugging it in at work, when our new space opens next month. Beautiful Bike. What is the range? In economy? In sport? How long to recharge from dead? A good chunk of my riding each year is a 74 mile/day commute at highway speeds. Cool, I am very interested to hear a "real world" opinion about these bikes. In many ways, I think electic vehicles are the future, but I'm not entirely convinced that the technology makes sense yet. With the rate at which battery technology advances, I see these sort of machines being competitive (price and performance) to internal combustion in the next 5-10 years. 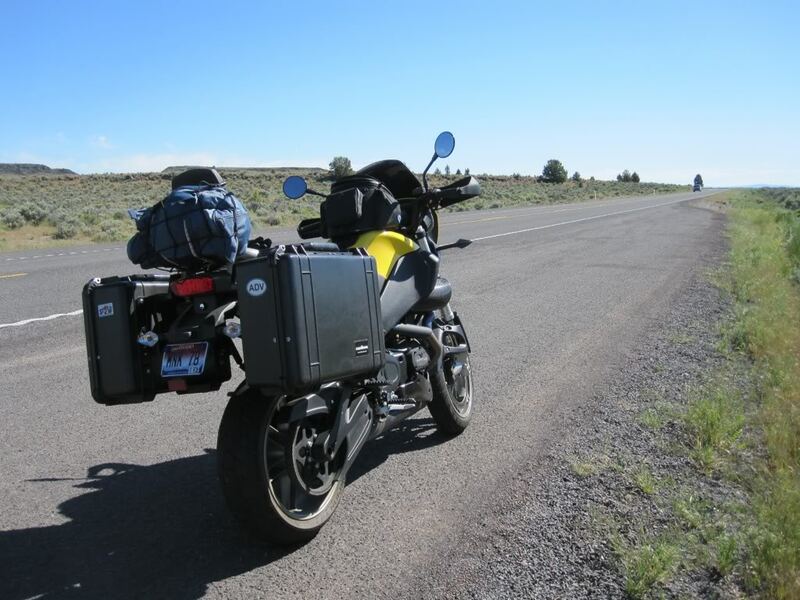 I think the short range of an EV makes sense for many everyday motorcyclists, though those of us on ADVrider like to invision the long trips, even though they account for only a very small percentage of our riding (for the most part). 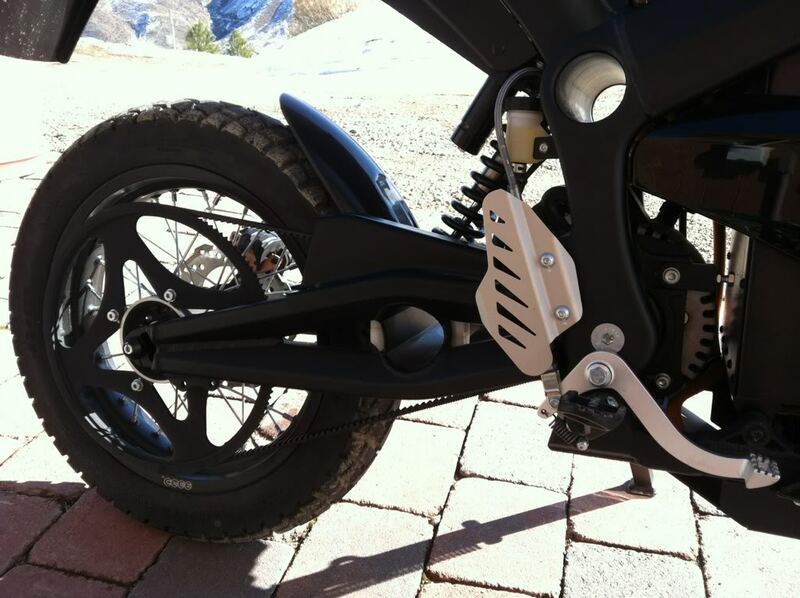 This zero bike seems great, but I am not interested at $14k. When the price can be more competitive with an ICE bike, I think they will sell plenty. 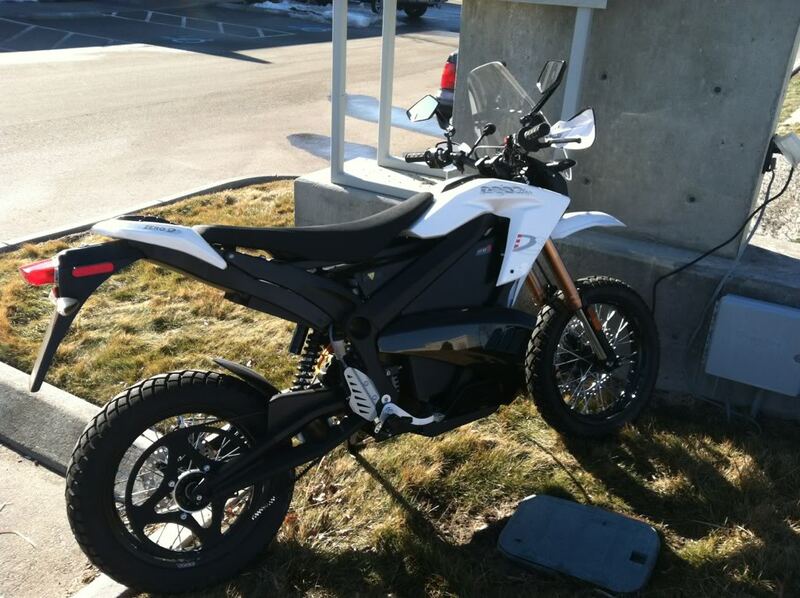 Thanks for posting this stuff - I've been intrigued by the electric bikes for a while now. What interval do you expect to have to replace the battery pack at? Very cool. I'll be following your report. Thanks for the thread. I'll be watching. I can't wait to be in a place where an electric makes more sense for my riding. How long does it take to top up the charge if the battery is at say, 50%? Just wondering if you could do a 200 mile day if 1, you can find an outlet, and 2, if it does'nt take too long to charge. A lunch break/mid day nap wouldn't be too hard to schedule. Thanks for the review, very interesting. Till battery technology gets allot better I think the electric MCs will be destined to be used for urban offroading and commuting. Someone needs to take the chinese approach to these, cheap off the shelf componets, use the bulk of the unit cost to fund the expensive batteries. Get it out to more riders at a reduced cost. IMO, affordabilty is what will turn the tide on electric vehicle use. I really enjoy riding the Zero in town. At first it seemed really strange to be sitting at a stop with nothing happening .... There is no idle. When not moving the bike indicates ON with the GRN light but the normal sensations are not there from an ICE. 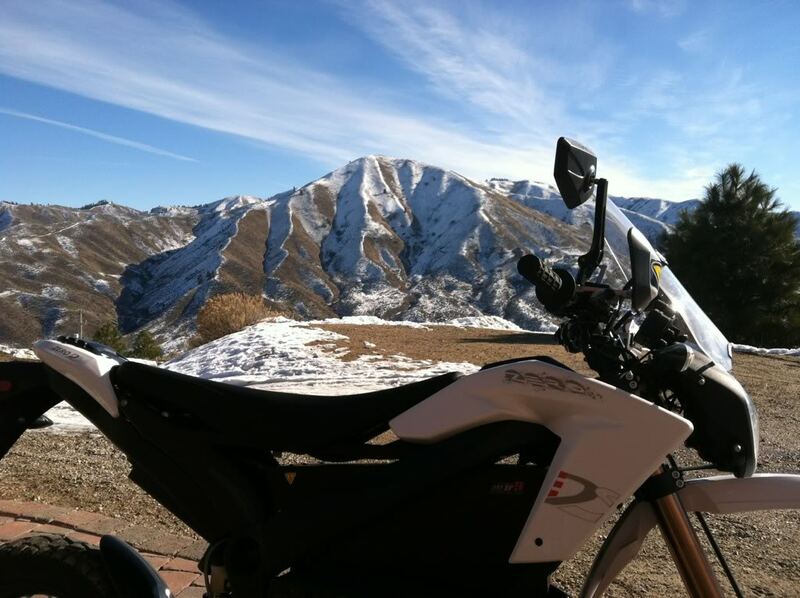 Now I really enjoy the silence and hear a lot of things that are missed on a conventional ICE motorcycle. One other thing to consider for in town riding is that "loud pipes save lives" thing.... I have surprised a few pedestrians who are listening more than looking before stepping into the street already. So far, not noticeable from other vehicle traffic and I never put much credence into making noise, but it is different. Range is more variable on an E bike than on a gas bike. 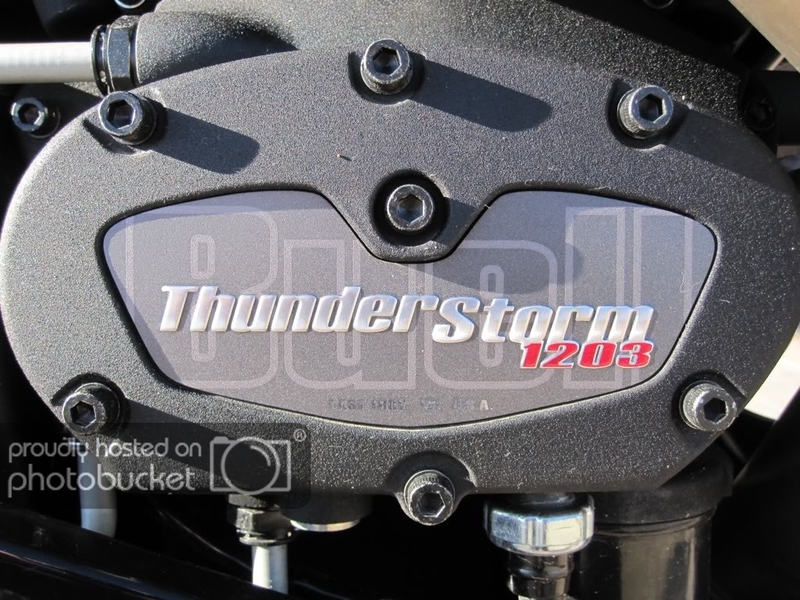 If you are in Sport mode and twisting the throttle aggressively, then the controller will dump a lot of energy into the motor and that will decrease range significantly. You can be in Sport mode and still easy on the right grip and still achieve significant range. I have heard from several people that range will increase slightly after some use. Range is decreased by several factors: Wind, hills, stop and go, aggressive riding. I have only ridden the bike far enough to test range twice here in Idaho as the weather is still cold here. The first time I achieved only 55 miles to the last 2 bars on the stored energy graph. There are a total of eleven bars on the graph so this works out about 6 miles / energy bar on the graph. There is a hidden bar so if it ran full to the last electron that would about 72 miles. Note that on this ride it was about 38 degrees and I was having some fun with Sport mode. Out of the 55 miles about 11 miles were dirt road and the rest twisty 2 lane. Top speed of 70 MPH, average probably about 55 except for dirt bits and the dirt road had some steep climbs. The second time I tested it temps were from 38 to 30 degrees and I rode twisty 2 lane highway with top speed of 60 MPH and made it to 61 miles before the flashing 2 bars popped up. I hope that range increases some when the weather warms up. If your commute is 74 miles round trip, no problem. 74 miles one way would be a stretch for this bike. Recharge from total discharge is about 9 hours for my bike which has the larger ZF9 battery. This is with the onboard charger. Another charger can be added in parallel and and costs about another $400 and cuts the recharge time in half.